My book review line up kismet does it to me again as I have two books in a row, accepted many months apart yet both having Native American themes. I really would love to know how I keep doing this time and time again. 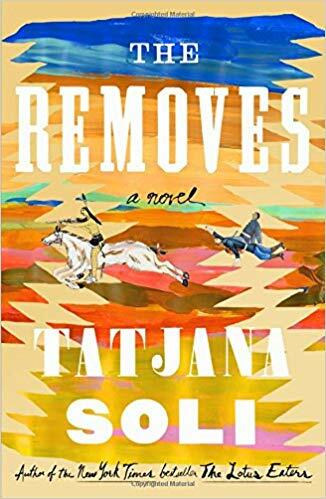 The Removes by Tatjana Soli is a more traditional tale taking the reader back to the world of “manifest destiny” and General George Armstrong Custer. I thank TLC Book Tours for sending me a copy at no charge for my honest review. Spanning the years of the first great settlement of the West, The Removes tells the intertwining stories of fifteen-year-old Anne Cummins, frontierswoman Libbie Custer, and Libbie’s husband, the Civil War hero George Armstrong Custer. When Anne survives a surprise attack on her family’s homestead, she is thrust into a difficult life she never anticipated?living among the Cheyenne as both a captive and, eventually, a member of the tribe. Libbie, too, is thrown into a brutal, unexpected life when she marries Custer. They move to the territories with the U.S. Army, where Libbie is challenged daily and her worldview expanded: the pampered daughter of a small-town judge, she transforms into a daring camp follower. But when what Anne and Libbie have come to know?self-reliance, freedom, danger?is suddenly altered through tragedy and loss, they realize how indelibly shaped they are by life on the treacherous, extraordinary American plains. This book follows the lives of three people; George Armstrong Custer, Libbie Custer and a young girl named Annie. I am sure all of you know the basics of Custer’s story including the debacle at Little Big Horn. As often happens with infamous men, the women behind them are often not as well known. I knew absolutely nothing about Custer’s wife prior to reading this novel. Annie is a fictional compilation of many of the white women taken hostage by Native Americans during this difficult time in history. The book alternates stories between George, Libbie and Annie starting with George’s joining the Union side during the Civil War and becoming a War Hero at a young age due to his actions on the battlefield. It shows the progression of Libbie’s life from a sheltered young girl who really didn’t want to get married because she felt it was more of a prison sentence and would curtail her ability to read and do what she wanted – UNTIL she was reintroduced to childhood acquaintance George Custer now returned to town as a conquering hero. Annie’s story is far less happy. She is living with her family on the prairie when their settlement is attached by Cheyenne and she is one of a few survivors taken prisoner. She survives by the skin of her teeth and is taken from place to place and traded from Chief to Chief – the Removes of the title – in a life of simply trying to survive in a place where she is not wanted. As the two stories work towards their inevitable crossover the reader learns about the lives of George and Libbie from his internal struggles to her adjustments to living on the frontier. Annie’s tale is nothing but struggle and sorrow except for the birth of her two children; their conceptions were not pleasant experiences for her but she does come to love them, fiercely. So much so that when she finally finds her way home she wants nothing more than to get them back. There is nothing easy about reading this book as it is not a happy tale. This period in the history of our country is a sad one. The treatment of the Native peoples was horrifying. The wars between Native tribes were horrifying. It was a violent time all around. Ms. Soli does not spare her reader that violence – either the war or the more personal types so be prepared for some difficult scenes to read. That being written, this is an excellent book and one that is hard to put down despite the dark nature of the story. It is not all death and destruction but there are no happy endings here. I am not spoiling any plot points as the history has been written and we know the end of Mr. Custer. There is also much written record as to how the women rescued from being held prisoner by Native Tribes were treated after they tried to reintegrate into society. But don’t let that history deter you from reading this book. It is a story that will stay with you and make you think. It does not give you a clean, clear, happy ending for there wasn’t one. In that it tells the truth even though it is a book of fiction.